Natural stone is a popular option in many landscaping projects. The right color and type of stone can add to the appearance and value of a property, and stone tends to look more natural than concrete or brickwork options. Unfortunately, stone patio materials can be expensive and may decay over years. Decomposed granite is a simpler and less expensive option that still gives landscapes a natural stone look. Decomposed granite begins as normal granite stone, often older stone found at quarries and other areas. Over time, wind, rain, cold and heat wear away at this granite until it breaks apart into smaller and smaller pieces, finally becoming gravel. This gravel is harvested and then either kept the same size or ground down to finer pieces as needed. When constructing houses, some contractors use decomposed granite as a foundation fill. Landscapers place the granite in driveways, patios, or roads. Larger commercial venues may use granite gravel to fill riding arenas or horse stalls. Governments can use it to pave hiking and biking trails or playgrounds in public areas. There are several types of decomposed granite, depending on what is mixed with it. Loose granite gravel is fine like sand. 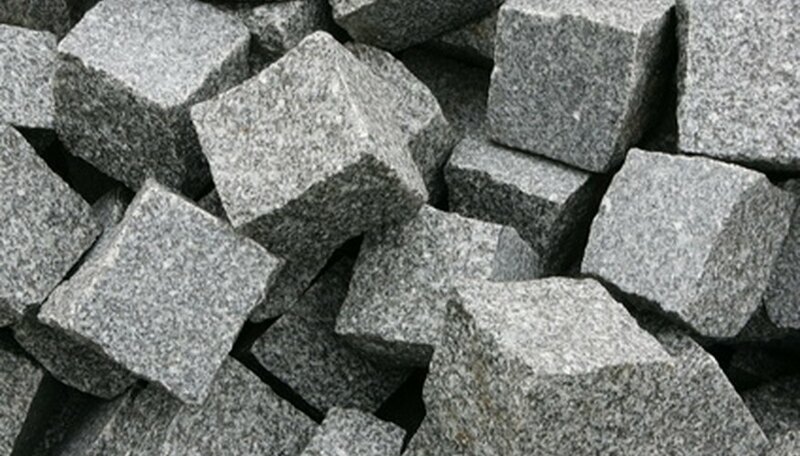 Another type of granite gravel is mixed with a light stabilizer to help keep the mixture more firmly in place. Some kinds of decomposed granite are even made with a resin that hardens and traps the granite in place, giving it either a rough or polished texture, depending on how the granite is used. Natural granite has several different shades available for homeowners, including gray, brown, tan and red. The material forms a compact surface that is not hard, yet still resists impact and provides comfortable resistance. Granite is also one of the more organic landscaping materials and will not wash away any synthetic materials or chemicals into the soil when it rains. Decomposed granite is not easy to install. Installers must use a professional compactor to beat the granite gravel down in place and make it solid enough to resist natural movement. Even then the granite is vulnerable to erosion from water sources, and logs or other barriers must be put into place so it does not eventually wash away. Collier Materials: What is Decomposed Granite?